The heartbroken mum of a stillborn baby has donated a special “CuddleCot” to a Birmingham hospital which will help other grieving parents. 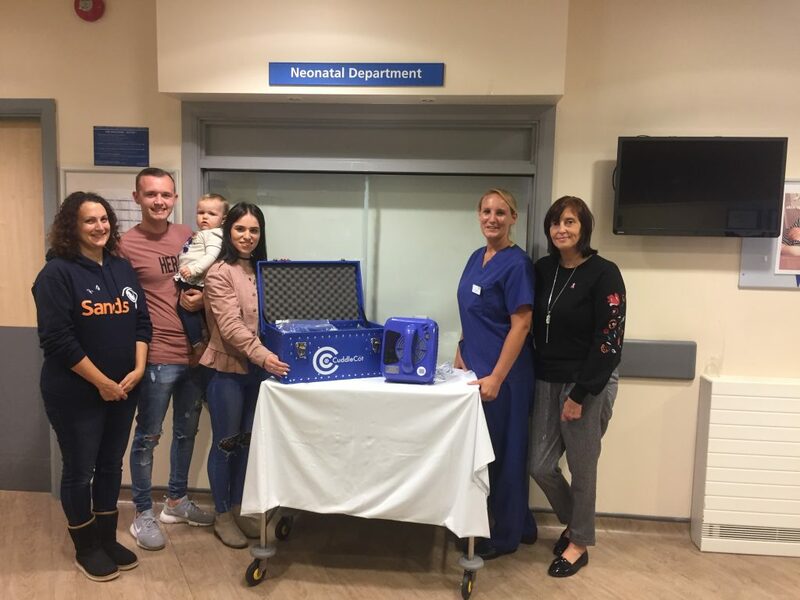 Kiera Pooler, of Brierley Hill, Dudley, raised enough cash to pay for the £1,600 device which she kindly handed over to the neonatal department, at City Hospital. The CuddleCot is a portable device that circulates cold air around babies who are sadly stillborn or die before they have a chance to go home, to allow parents precious time to be with their baby before leaving the hospital. Kiera was 27 weeks pregnant, when she found out her son, who she named Rogan-Lee, had died. Both Kiera and her partner Jake Hildred, aged 22, got to spend time with their baby after he was born at Russells Hall Hospital, in Dudley, because it had a CuddleCot. The 21-year-old, who has since had a healthy baby girl called Leila-Mai, now aged 15 months, explained: “Jake and I were able to have that extra time with Rogan-Lee after he was born, and it meant so much to us. My family also got to see him. “However, at the time, there was only one device there and there were five other parents who had babies that were born sleeping that day. Since the tragedy, which happened more than two years ago, Kiera has carried out various activities to raise the money and sold badges and tops with “Rogan-Lee’s Charity” written on them. She added: “Once I had raised enough money I found out that Russells Hall didn’t need a CuddleCot, so Sands (Stillbirth and neonatal death charity) put a call out to find out which hospitals were in need of the cot. City Hospital came forward and so I was delighted to make the donation to them. Fran Wootton, Advanced Neonatal Nurse Practitioner at City Hospital said: “We are extremely grateful for the kind and generous donation of this cuddle cot in memory of Rogan-Lee. We have complete admiration for the effort and dedication to raise the funds needed for the purchase of this cuddle cot. “We cannot thank Rogan-Lee’s parents enough for what they are doing for our unit and for other parents who will benefit massively from another cuddle cot, giving other parents the chance to have precious time with their baby should they sadly go through the same or a similar experience. Erica Stewart, Bereavement Support and Awareness Specialist at Sands, said: “A CuddleCot is an option chosen by many parents.